Simply Superb. very Nicely seen, captured, and worked Image. You have an expert hand of PS as well. A request, we all would like to see the original image. Is it possible..?? Excellent work with wonderful colors! It freezes me for several minutes. What can I say, looks like life on a different planet. Congrats on BIP & PD ! Dramatic land/seascape. Outstanding work! Congratulations on your well-deserved award. Awesome Nick! I just love the atmosphere and mood in this one...WTG! Wow! This is an awesome image. I love it. Your composition is ecxcellent and your colours are glorious. Congratulations on the well deserved Awards. WOW! what a fantastic shot! Besides that it is a nice shot but I don't get the light part on the tree..
Nicely shot. Beautiful. Great positioning. Nice tone. Not a lot to say after everyone..I think it's perfect. It is strange how there seems to be light on a small patch on the sand and part of the tree. I don't know whether it is because of some processing lapse or something else. Apart from that this is a beautiful picture, with a moody seaside sunset and the inclusion of human figures to make it complete. Congrats on a great job and well deserved awards. Breathtaking Nick . . . Congrats in the awards! You should sell this one to the local tourist office. Sitting here in a UK winter makes me want to be there real bad. woow! really deserve the double award! very nicely done, very well deserved awards. Just perfect! Beautiful photo indeed. Well composed with great colors, light and Sky. Congratulations on the awards! congratulations for the double award!!!!! Outstanding seascape, brilliant colors, lovely deal with contrast. Well deserved awards! 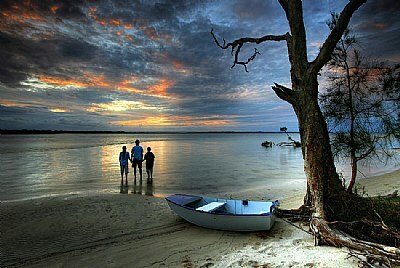 WOW..wonderful seascape shot!Great details,colors and so well composed!Congratulations on your well deserved awards!! this is absolutely brilliant shot. Congrats for the awards Nick. EXCELLENT! Congratulations for the colors and the mood of the photo...worths a lot! ery peaceful image - love the smoothness of it. Oh wow. What a magical moment you captured, Nick. This is an outstanding story frozen forever.